Engineering drawing and artistic types of drawing, and either may be called simply "drawing" when the context is implicit. Engineering drawing shares some traits with artistic drawing in that both create pictures. But whereas the purpose of artistic drawing is to convey emotion or artistic sensitivity in some way (subjective impressions), the purpose of engineering drawing is to convey information (objective facts). One of the corollaries that follow from this fact is that, whereas anyone can appreciate artistic drawing (even if each viewer has his own unique appreciation), engineering drawing requires some training to understand (like any language); but there is also a high degree of objective commonality in the interpretation (also like other languages). In fact, engineering drawing has evolved into a language that is more precise and unambiguous than natural languages; in this sense it is closer to a programming language in its communication ability. Engineering drawing uses an extensive set of conventions to convey information very precisely, with very little ambiguity. The process of producing engineering drawings, and the skill of producing those, is often referred to as technical drawing or drafting (draughting) although technical drawings are also required for disciplines that would not ordinarily be thought of as parts of engineering (such as architecture, landscaping, cabinet making, and garment-making). Persons employed in the trade of producing engineering drawings were called draftsmen (or draughtsmen) in the past. Although these terms are still in use, the not -gender-specific terms draftsperson and drafter are now more common. Engineering drawings specify requirements of a component or assembly which can be complicated. Standards provide rules for their specification and interpretation. Standardization also aids internationalization, because people from different countries who speak different languages can read the same engineering drawing, and interpret it the same way. 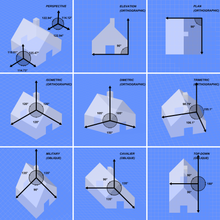 One major set of engineering drawing standards is ASME Y14.5 and Y14.5M (most recently revised in 2009). These apply widely in the United States, although ISO 8015 (Geometrical product specifications (GPS) — Fundamentals — Concepts, principles and rules) is now also important. In 2011, a new revision of ISO 8015 (Geometrical product specifications (GPS) — Fundamentals — Concepts, principles and rules) was published containing the Invocation Principle. This states that, "Once a portion of the ISO geometric product specification (GPS) system is invoked in a mechanical engineering product documentation, the entire ISO GPS system is invoked." It also goes on to state that marking a drawing "Tolerancing ISO 8015" is optional. The implication of this is that any drawing using ISO symbols can only be interpreted to ISO GPS rules. The only way not to invoke the ISO GPS system is to invoke a national or other standard. In Britain, BS 8888 (Technical Product Specification) has undergone important updates in the 2010s. For centuries, until the post-World War II era, all engineering drawing was done manually by using pencil and pen on paper or other substrate (e.g., vellum, mylar). Since the advent of computer-aided design (CAD), engineering drawing has been done more and more in the electronic medium with each passing decade. Today most engineering drawing is done with CAD, but pencil and paper have not entirely disappeared. For centuries, engineering drawing was the sole method of transferring information from design into manufacture. In recent decades another method has arisen, called model-based definition (MBD) or digital product definition (DPD). In MBD, the information captured by the CAD software app is fed automatically into a CAM app (computer-aided manufacturing), which (with or without postprocessing apps) creates code in other languages such as G-code to be executed by a CNC machine tool (computer numerical control), 3D printer, or (increasingly) a hybrid machine tool that uses both. Thus today it is often the case that the information travels from the mind of the designer into the manufactured component without having ever been codified by an engineering drawing. In MBD, the dataset, not a drawing, is the legal instrument. The term "technical data package" (TDP) is now used to refer to the complete package of information (in one medium or another) that communicates information from design to production (such as 3D-model datasets, engineering drawings, engineering change orders (ECOs), spec revisions and addenda, and so on). However, even in the MBD era, where theoretically production could happen without any drawings or humans at all, it is still the case that drawings and humans are involved. It still takes CAD/CAM programmers, CNC setup workers, and CNC operators to do manufacturing, as well as other people such as quality assurance staff (inspectors) and logistics staff (for materials handling, shipping-and-receiving, and front office functions). These workers often use drawings in the course of their work that have been produced by rendering and plotting (printing) from the MBD dataset. When proper procedures are being followed, a clear chain of precedence is always documented, such that when a person looks at a drawing, s/he is told by a note thereon that this drawing is not the governing instrument (because the MBD dataset is). In these cases, the drawing is still a useful document, although legally it is classified as "for reference only", meaning that if any controversies or discrepancies arise, it is the MBD dataset, not the drawing, that governs. section – are thin lines in a pattern (pattern determined by the material being "cut" or "sectioned") used to indicate surfaces in section views resulting from "cutting". Section lines are commonly referred to as "cross-hatching". phantom – (not shown) are alternately long- and double short-dashed thin lines used to represent a feature or component that is not part of the specified part or assembly. E.g. billet ends that may be used for testing, or the machined product that is the focus of a tooling drawing. Type k lines indicate the alternate positions of an object and the line taken by that object. These are drawn with a long line of 10-20 mm, then a small gap, then a small line of 2 mm, then a gap, then another small line. 2H pencil. Symbols used to define whether a projection is either first-angle (left) or third-angle (right). A multiview projection is a type of orthographic projection that shows the object as it looks from the front, right, left, top, bottom, or back (e.g. the primary views), and is typically positioned relative to each other according to the rules of either first-angle or third-angle projection. The origin and vector direction of the projectors (also called projection lines) differs, as explained below. In first-angle projection, the parallel projectors originate as if radiated from behind the viewer and pass through the 3D object to project a 2D image onto the orthogonal plane behind it. The 3D object is projected into 2D "paper" space as if you were looking at a radiograph of the object: the top view is under the front view, the right view is at the left of the front view. First-angle projection is the ISO standard and is primarily used in Europe. In third-angle projection, the parallel projectors originate as if radiated from the far side of the object and pass through the 3D object to project a 2D image onto the orthogonal plane in front of it. The views of the 3D object are like the panels of a box that envelopes the object, and the panels pivot as they open up flat into the plane of the drawing. 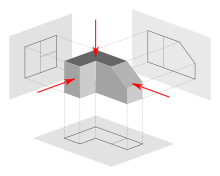 Thus the left view is placed on the left and the top view on the top; and the features closest to the front of the 3D object will appear closest to the front view in the drawing. Third-angle projection is primarily used in the United States and Canada, where it is the default projection system according to ASME standard ASME Y14.3M. Until the late 19th century, first-angle projection was the norm in North America as well as Europe; but circa the 1890s, third-angle projection spread throughout the North American engineering and manufacturing communities to the point of becoming a widely followed convention, and it was an ASA standard by the 1950s. Circa World War I, British practice was frequently mixing the use of both projection methods. Not all views are necessarily used. Generally only as many views are used as are necessary to convey all needed information clearly and economically. The front, top, and right-side views are commonly considered the core group of views included by default, but any combination of views may be used depending on the needs of the particular design. In addition to the six principal views (front, back, top, bottom, right side, left side), any auxiliary views or sections may be included as serve the purposes of part definition and its communication. View lines or section lines (lines with arrows marked "A-A", "B-B", etc.) define the direction and location of viewing or sectioning. Sometimes a note tells the reader in which zone(s) of the drawing to find the view or section. An auxiliary view is an orthographic view that is projected into any plane other than one of the six primary views. These views are typically used when an object contains some sort of inclined plane. Using the auxiliary view allows for that inclined plane (and any other significant features) to be projected in their true size and shape. The true size and shape of any feature in an engineering drawing can only be known when the Line of Sight (LOS) is perpendicular to the plane being referenced. It is shown like a three-dimensional object. Auxiliary views tend to make use of axonometric projection. When existing all by themselves, auxiliary views are sometimes known as pictorials. An isometric projection shows the object from angles in which the scales along each axis of the object are equal. Isometric projection corresponds to rotation of the object by ± 45° about the vertical axis, followed by rotation of approximately ± 35.264° [= arcsin(tan(30°))] about the horizontal axis starting from an orthographic projection view. "Isometric" comes from the Greek for "same measure". One of the things that makes isometric drawings so attractive is the ease with which 60° angles can be constructed with only a compass and straightedge. Projected views (either Auxiliary or Multiview) which show a cross section of the source object along the specified cut plane. These views are commonly used to show internal features with more clarity than may be available using regular projections or hidden lines. In assembly drawings, hardware components (e.g. nuts, screws, washers) are typically not sectioned. Plans are usually "scale drawings", meaning that the plans are drawn at specific ratio relative to the actual size of the place or object. Various scales may be used for different drawings in a set. For example, a floor plan may be drawn at 1:50 (1:48 or ​1⁄4″ = 1′ 0″) whereas a detailed view may be drawn at 1:25 (1:24 or ​1⁄2″ = 1′ 0″). Site plans are often drawn at 1:200 or 1:100. Technical lettering is the process of forming letters, numerals, and other characters in technical drawing. It is used to describe, or provide detailed specifications for an object. With the goals of legibility and uniformity, styles are standardized and lettering ability has little relationship to normal writing ability. Engineering drawings use a Gothic sans-serif script, formed by a series of short strokes. Lower case letters are rare in most drawings of machines. ISO Lettering templates, designed for use with technical pens and pencils, and to suit ISO paper sizes, produce lettering characters to an international standard. The stroke thickness is related to the character height (for example, 2.5mm high characters would have a stroke thickness - pen nib size - of 0.25mm, 3.5 would use a 0.35mm pen and so forth). The ISO character set (font) has a seriffed one, a barred seven, an open four, six, and nine, and a round topped three, that improves legibility when, for example, an A0 drawing has been reduced to A1 or even A3 (and perhaps enlarged back or reproduced/faxed/ microfilmed &c). When CAD drawings became more popular, especially using US American software, such as AutoCAD, the nearest font to this ISO standard font was Romantic Simplex (RomanS) - a proprietary shx font) with a manually adjusted width factor (over ride) to make it look as near to the ISO lettering for the drawing board. However, with the closed four, and arced six and nine, romans.shx typeface could be difficult to read in reductions. In more recent revisions of software packages, the TrueType font ISOCPEUR reliably reproduces the original drawing board lettering stencil style, however, many drawings have switched to the ubiquitous Arial.ttf. With the advent of computer generated drawings for manufacturing and machining, many symbols have fallen out of common use. This poses a problem when attempting to interpret an older hand-drawn document that contains obscure elements that cannot be readily referenced in standard teaching text or control documents such as AMSE and ANSI standards. For example, AMSE Y14.5M 1994 excludes a few elements that convey critical information as contained in older US Navy drawings and aircraft manufacturing drawings of World War 2 vintage. Researching the intent and meaning of some symbols can prove difficult. Technical drawing has existed since ancient times. Complex technical drawings were made in renaissance times, such as the drawings of Leonardo da Vinci. Modern engineering drawing, with its precise conventions of orthographic projection and scale, arose in France at a time when the Industrial Revolution was in its infancy. L. T. C. Rolt's biography of Isambard Kingdom Brunel says of his father, Marc Isambard Brunel, that "It seems fairly certain that Marc's drawings of his block-making machinery [in 1799] made a contribution to British engineering technique much greater than the machines they represented. For it is safe to assume that he had mastered the art of presenting three-dimensional objects in a two-dimensional plane which we now call mechanical drawing. It had been evolved by Gaspard Monge of Mezieres in 1765 but had remained a military secret until 1794 and was therefore unknown in England." ^ a b c French 1918, p. 78. ^ French & Vierck 1953, p. 102. ^ a b Rolt 1957, pp. 29–30.